Work on the landmark new community is progressing well with two more Redrow show homes now open at the Amington Green phase in addition to the four that have been wowing visitors to Amington Fairway since the summer. Combining traditional Arts & Crafts inspired architecture with interiors designed with how real families live today, Redrow’s Heritage Collection homes offer the best of old and new. The new show homes at Amington Green are an Oxford Lifestyle, a surprisingly spacious home with all three bedrooms boasting an en-suite, and a four-bedroom Shrewsbury style property. Both are detached designs. “At Amington Fairway the show homes are very much designed with family living in mind, but we also recognise that there’s a demand from the over 55 market including downsizers or rightsizers as we prefer to call them,” Pauline adds. The ground floor of the Shrewsbury is similar in that there’s a combined kitchen and dining room, with handy utility and cloakroom to the rear of the property, and lounge at the front. Journey upstairs and there are four bedrooms, including master with en-suite, plus the family bathroom. Along with building new homes on the former golf course site, Redrow will invest around £14 million to help ensure Amington Garden Village is sustainable for the benefit of the wider community. This includes contributions towards the cost of building a new primary school, creating a new community woodland, extending the Hodge Lane Local Nature Reserve and funding improvements to sports facilities. 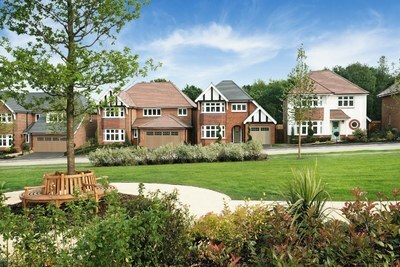 For more information about Amington Fairway see redrow.co.uk/amington. To find out more about Amington Green see redrow.co.uk/amingtongreen.